This article is about the 1962 film. For the historical event the film is based on, see Trial of Joan of Arc. The Trial of Joan of Arc (French: Procès de Jeanne d'Arc) is a 1962 French historical film directed by Robert Bresson. Joan of Arc is played by Florence Delay. As with Bresson's most renowned films, The Trial of Joan of Arc stars non-professional performers and is filmed in an extremely spare, restrained style. Bresson's screenplay is drawn from the transcriptions of Joan's trial and rehabilitation. Bresson's Joan of Arc is often compared with The Passion of Joan of Arc (1928) by Carl Theodor Dreyer. Bresson compared that film unfavorably with his own, expressing his dislike of the actors' "grotesque buffooneries" in Dreyer's film. In 1431 Jeanne, a French peasant girl, is imprisoned for heresy and brought to trial at Rouen. Despite rigorous interrogation by the judges and constant persecution from the jailers, her faith remains unshaken. The relentless theological questioning and argument in court is broken only by an ineffectual attempt at torture and an examination to prove her virginity. Jeanne's insistence that her military ventures were bidden by God is scoffed at by the English, who are anxious to destroy the legend already building around her.7fbIn a moment of weakness during the trial, Jeanne recants her faith. She is sentenced to life imprisonment, but when she retracts her earlier confession, the court decrees that she be burned at the stake as a witch. 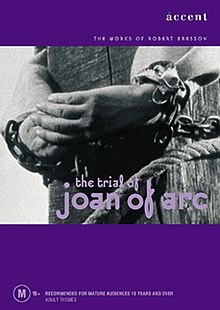 The Trial of Joan of Arc was not warmly received by critics on its original release. While it remains less acclaimed than most of Bresson's previous works, retrospective reviews are nonetheless positive. It holds a 100% rating on Rotten Tomatoes, with an average rating of 8.2/10. ^ "The Trial of Joan of Arc". unifrance.org. Retrieved 2014-03-11. ^ Hartman, Lauren R. (2002-07-01). Tf. Cahners Publishing. OCLC 926229290. ^ "Trial of Joan of Arc (1965)". tcm.com. Retrieved 2014-12-12. ^ Sontag, Susan (1982). A Susan Sontag Reader. Macmillan. p. 122. ISBN 0374272158. ^ "Robert Bresson's Acclaimed Films". Retrieved February 27, 2017. ^ "Procès de Jeanne d'Arc (Trial of Joan of Arc)". Rotten Tomatoes. Retrieved February 27, 2017. ^ "Festival de Cannes: The Trial of Joan of Arc". festival-cannes.com. Retrieved 2009-02-24. This page was last edited on 1 April 2019, at 17:39 (UTC).